The first time I saw Philippa was at SWARM 2017. It wasn’t the first time I’d heard of her though. But the way she spoke!!!. She was on the panel discussing “the state of hardware innovation in Uganda and I was enthralled by what she spoke about, presentation and analysis. I decided then that I should do some digging on her and here we are…she’s our #WCW today. Philippa is an Electrical Engineer, currently heading the Instrumentation Division at Uganda Industrial Research Institute (UIRI), where she leads a team of electrical and computer engineers that design and develop electronic devices for healthcare, agriculture, control systems for small and medium enterprises and the energy industry. She started this journey at the University of Alberta in Canada where she graduated with a BSc in Electrical Engineering in 2008. She also earned a professional certificate in embedded systems engineering from the University of California, Irvine, United States. At the end of the day, Philippa decided that home, in Uganda, is where she would come and practice. The innovator that Philippa is has had numerous award-winning projects ever since. 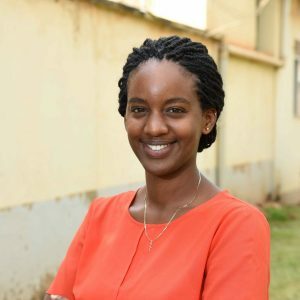 She and her team got the first runners-up award at the 2017 Innovation Prize for Africa, where they designed the Electronically Controlled Gravity Feed Infusion Set (ECGF) and a 1st Place Innovation Award at the 2016 World Patient Safety, Science, and Technology Summit, among others. Currently, Philippa’s passion is pushing her to work on multiple projects that are aimed at improving the health sector in Uganda. Surprisingly as a child I always wanted to be an engineer, I used to repair gadgets at home that weren’t working well. Growing up in the 1990’s we had video tape players and old school radios which I used to enjoy troubleshooting and fixing. I loved Maths and Science as a child and took part in science fairs and Maths competitions from an early age; about seven years old. My day starts at 8 am. I start by checking and responding to emails (high priority first) up to 9 am when I have our daily ‘scrum’ meeting with my team. 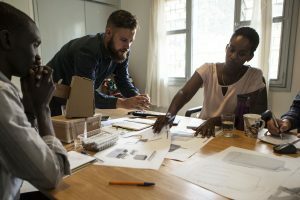 Basically, a scrum meeting lasts only 15 minutes, everyone stands around in a circle we say a quick prayer and everyone has to say what they did the day before, what they will do that day and mention anything blocking them from achieving their goals. This keeps the entire team on their toes and keeps them accountable for progress on deliverables including myself. From 9.15am I actually start my day which includes supervising product development, writing grant proposals or research papers, computing financials, Skype calls with international partners or face to face meetings with local partners. Every day is different so it depends on the highest priority task at hand. What were some of the challenges you faced pursuing a career in Electrical Engineering? Some of the biggest challenges in my career is the skepticism senior management has on your ideas and proposals before they come to life. I have proposed some risky project proposals some of which have never been done and this was met with apprehension. When I was, however, able to prove that I could execute them well I received a lot of support. Sourcing inputs for our product development has been particularly daunting, electronic components and equipment are quite expensive and require a significant investment. Our development budget was initially solely funded by the government and this was inadequate so we had to apply for external funding which has enabled us to make significant advancements. Looking for funding and being granted funding was also a long and tedious process, with barely a track record in medical device development we received several rejections and then finally landed on our first prize after four years of hard work, after that the funding came in a lot quicker. 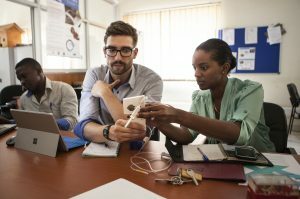 What do you think we should learn from other countries in the tech space for example in health and adoption of IT at work? We can learn from the developed nations to be systematic in our design process, making sure that we adhere to standards early on, and ensuring internal quality control systems, good laboratory practices, and professionalism. If every start-up in the health tech space can reasonably apply a stringent design process for their product development we would definitely set the standard for our fellow African innovators. We need to form support groups to encourage young girls to pursue careers in Science Technology Engineering and Mathematics (STEM). I’m glad to let you know that I’m now the chairperson of the Institute of Electrical and Electronics Engineers (IEEE) Women in Engineering Uganda Subsection and one of my goals is to reach out to young girls, mentor them and encourage them to pursue STEM-related careers. Girls need a platform to freely share ideas without feeling held back to show that they do not understand a concept. At the end of the day we experience several failures and rejections but with persistence, dedication and a strong will, anything can be achieved. Interesting question! I would tell a younger me to block out all the negativity that you cannot do it and focus on being her absolute best. I was blessed to have extremely supportive and encouraging parents whom I owe a lot of my success to; they always told me I could do better even when I was at my best. They instilled discipline and confidence in me which are invaluable tools to make it in the real world. Tell us about your mentorship program with tertiary institutions in Uganda and what it is aimed at? Uganda Industrial Research Institute has an annual industrial skills training program, in my division, the Instrumentation Division we accept applicants who are students pursuing bachelors or diplomas in electrical, computer or biomedical engineering. We take them through our design process and equip them with the skills they apply to a design project at the end of the internship program. The goal is to instill the applied approach to electronics development to encourage innovation. Are there any specific things outside of work that you have done to keep growing, glowing and developing as an individual? If yes, what are they? Yes, I play piano and I teach children piano. I love children so this is a very fulfilling activity, I also enjoy long distance running and swimming. With all this said, we can only add so much. We are just happy that Philippa has dedicated her life to the betterment of her society and improvement of ICTs in the health sector.